Dig In : As a heavy equipment operator, you’re a key member of the construction site responsible for digging trenches, moving earth, busting up concrete, filling holes, and so much more. It’s your job to complete big tasks with finesse and skill. All eyes are on you as you start out in training and work your way up through increasingly more complicated jobs. Think you have basic moving and digging down? Well let’s see how you do at night in a busy city environment with cars, dozers, and other equipment racing by you. Not only are you trying to do the job right and on time, but you must avoid hitting utilities and other vehicles as well. Will you crumble under the pressure, or dig in to get the job done? It’s not all work. As you build up your reputation and get noticed as a skilled operator, you will be approached with special bonus challenges. Block all the boulders from getting past you as they race downhill. See how quickly you can score some baskets in a game of excavator basketball. How about some larger than life mini-golf? Use the same hand-eye coordination and spatial awareness in this game as the real heavy equipment operators out on the jobsite. Perform well enough and you could be directed to real life operator opportunities in your area! Choose between Simplified controls or challenging Realistic excavator controls. 13 levels with increasingly difficult tasks. 3 fun and challenging bonus levels. Dig trenches, move earth, fill in holes with gravel, and bust up concrete with a hoe ram. Beautiful 3D graphics and sound design. Links to real life heavy equipment opportunities. Badge earning through the Skill Arcade. 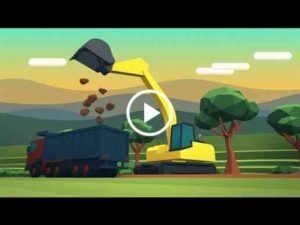 Dig In was developed by the International Union of Operating Engineers Local 66 and Simcoach Games to build awareness of the career opportunities in heavy equipment operation and to connect players to real life apprenticeships. Dig In: An Excavator Game is a Simcoach Skill Arcade app. Explore careers, practice basic job skills and earn badges to gain exposure to careers and training opportunities in your area. To learn more about the Skill Arcade check out www.simcoachgames.com.